CARBONDALE, Ill. — It has been more than 66 years since David Rendleman entered Southern Illinois University Carbondale as a pre-med student. And his fondness for the university has never wavered. The Anna native, who practiced medicine for 31 years in Carbondale and served close to 40 years in the medical field, enrolled at SIU Carbondale in 1947. Shortly afterward, legendary SIU President Delyte Morris assumed the reins at the university. 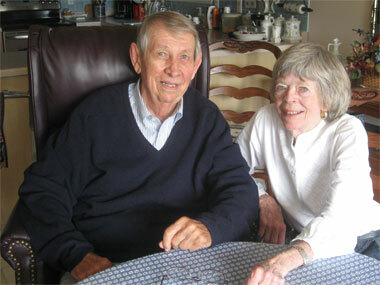 Rendleman and his wife, Mary, want students to continue to enjoy such experiences. The couple recently contributed $100,000 to the David F. and Mary G. Rendleman Pre-Med Scholarship that they originally established in 2010. The award is presented annually to an incoming freshman who is a graduate of Anna-Jonesboro Community High School — or another neighboring Southern Illinois high school in Union, Williamson, Alexander or Pulaski counties — with a desire to study pre-med at SIU. The Rendlemans are committed to making a difference in the lives of SIU students. And in the process, they admit it has been a gratifying experience. The Rendleman family has a longstanding relationship with SIU. David’s brother, John, studied pre-law at SIU Carbondale before serving as its legal counsel, and later serving as Chancellor at SIU Edwardsville. SIU has been responsible for the education of the Rendlemans’ three daughters — Jill, who received her master’s degree from SIU Carbondale in 1979 and has proceeded to attain success in agricultural business; Amy, a registered nurse, who earned her nursing degree at SIU Edwardsville and Laurie, a dermatologist in Lexington, Ky., who received a medical degree from SIU Carbondale in 1995. David, who graduated from the University of Illinois in 1954, served two years in the Navy and completed his residency at Presbyterian Hospital in Chicago in 1961. He met Mary, a Vandalia native, as he was graduating from medical school and she was completing nursing training. They lived in Chicago, where David spent four years in surgical training. While they enjoyed what Chicago had to offer, they chose to return to Southern Illinois to raise their children. The couple has been married for 59 years. “We’ve had some wonderful years here in Carbondale. It is a great place to raise a family and we love it here,” Mary said. “It’s been a great life for us and Carbondale is a wonderful town,” he said. “The university has always been a driving economic engine of this region. As a result, we have met some fine people. There are many cultural advantages here and we are big Saluki sports fans.